Late summer afternoons on the patio rocker with mother; tending the garden at dusk; mowing the expansive lawn at a slow pace; turning a fallen tree into warmth; a firm handshake and an honest word; a simple life with enormous impact. These short sentences paint a picture of a man who impacted so many with his simple way of life. Paul Albert McDermott, Sr. was not a scholar nor was he the wealthiest man on the block. In fact, with only a 10th grade education, Paul provided for his family and was quite the innovator. He could take coffee cans and make elaborate organizers that even The Container Store would admire. He saved countless gallon milk jugs that he would cut in half to protect his small tomato plants from an early frost. Before “going green” became trendy, Paul acquired fourteen 50-gallon, plastic barrels (that would have most likely been discarded) from his nephew that he positioned around his old chicken coop to catch the rain. The rainwater was then used to help his garden thrive from year to year. I’m certain Paul was happy he didn’t have to pay Lowe’s $150 for just one barrel. Material things did not matter to Paul. Paul's riches came in the form of people and the natural elements that surrounded him. His greatest treasure and the purpose of his life was his wife, Peggy. For 65 years Peggy and Paul were an institution of love, and for many, defined the word. Peggy and Paul raised three children: Paul Jr., Jean, and Dave. Together, Peggy and Paul taught their children to live life humbly, respect those around you, and never waste a crumb. These life lessons were not epic, however; the impact and evidence can be seen in their lives and the lives of their children, grandchildren and great grandchildren. Next to Peggy and his family, Paul had his garden and the natural, rural elements that surrounded him in Overlook, PA. If a famed artist were to ask anyone who knew Paul how he or she should go about painting his portrait, it would most certainly show him standing in his garden just as the sun went down, leaving the sky brushed with hues of pink, blue and white. He would be dressed in grey pants and a white shirt and in his left hand he would have a plastic bag filled with potatoes. From his early days tending to and riding horses at the Pine Barn in Danville, Paul had a devout appreciation for nature and the bounty it bestowed upon us. Paul reveled with joy when he unearthed a potato from his garden and knew that his price for that single potato would beat any market price. 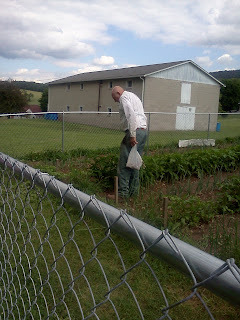 His cucumbers were a delight and he taught most of his family how to enjoy radishes and lima beans. The corn Paul grew was of the sweetest variety and was an experience unto itself. Paul, in his frugal nature, loved making the most of a fallen tree or any unwanted wood that may have otherwise been thrown by the wayside. About two years ago, he built a seat from old lumber - that would have otherwise been discarded - near his garden. What was the seat for? “It’s a nice place to sit and watch the garden or take a break”. Beyond his tractors and his trap shoot launcher, Paul's favorite toy was his wood splitter. As legend has it, it was slightly better than Paul Junior's. Paul enjoyed watching the power of his wood splitter and how efficient it made cutting wood. Many hours were spent splitting wood with Dave and Paul Junior. Around the campfire with Jean and Dave, Paul would often ask Dave to put more wood on the already burning "toothpicks". Paul's wood stacks were neat and meticulously calculated. Along with Peggy and his family those cuts of wood generated many good laughs and stories around hearths and countless campfires. While most would see a simple slice of wood, Paul saw an element that brought his family together for many years. In death, Paul returns to the earth he so loved working with. He also returns to the person he treasured most in this world, Peggy. When you think of Peggy and Paul you think of one of life's greatest love stories. You think of two, humble, generous people who lived life simply and honestly. In a fast-paced world, inundated with greed, self-promotion and competitive gains, Peggy and Paul walked gently together; always giving, compassionate and never wanting. This evening, and many summer evenings to come, just as the sun slides past the horizon and the cool summer air invades the landscape along with the majestic hues of the sky know that Peggy and Paul are sitting together with you on the patio gently rocking back in forth in their chairs. A week ago my brother married his best friend, Kelly Marion. The wedding was a beautiful occasion and brought together friends and family from all over the country. For many, it was the first time connecting in person for quite awhile. Friends that were once accessible daily, were now growing up and out with children of their own. The endless hours of carefree youth, now seemed significantly smaller. However, there was one person who could not connect with his family and friends in person. My Grandpa McDermott could not make the long journey from Central Pennsylvania to Boston for the wedding, but we decided to bring him there via technology. 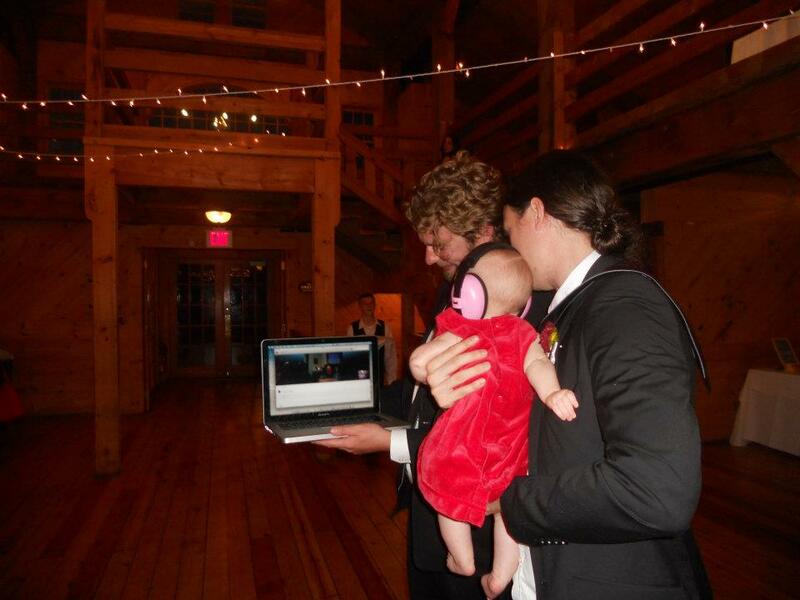 With a fully charged laptop, a great friend, Keith Zulawnik, a wi-fi connection and a Skype account, we brought my Grandfather along with my Uncle Paul and Aunt Yvonne to the wedding. My Grandfather witnessed his Grandson get married, connected with cousins and new babies and friends who just wanted to say hello. I imagine when my Grandfather was marrying my Grandmother over 66 years ago, he could have never imagined the setup that sat before him. This is why technology is a good thing. This setup was nothing revolutionary in the realm of innovation and technology, but the simple connection that it allowed was beyond anything I could ever write. And this is where we sometimes get lost in the daily stream of self affirmation and static surrounding the educational technology world. The technology we incorporate is not about us or even about the technology itself, but more importantly it's about the connections that it allows us to make. Too many times we get caught up in what is best for us, as educators, and worrying about technology bringing about a "change in working conditions" or something, "I'll never be able to understand", but that should never be the case for technology integration. Technology simply allows us to create a more engaging experience for our students. Technology provides us with avenues to make connections with our past while gaining a better understanding of our present as we step towards the future. Teaching with technology is not a sprint, nor should it be mandated as something everyone must use. Simply put, technology, in its simplest form can connect many and provide us with opportunities we may have otherwise missed. For my Grandfather, this simple connection was probably one of the best things he has seen in his life. And I am certain it will be a happy memory for him many years to come. As we spend our summers thinking of ways to innovate our classrooms and incorporate new and emerging technologies, let us not overlook the simple connections we can make with our students and within our classrooms. Don't panic. Technology integration is not a sprint. Consider the skills and lessons you want to convey to your students before thinking of adding a layer of technology. The technology piece will eventually arrive in a blissful eureka moment accompanied by a refreshing smile.